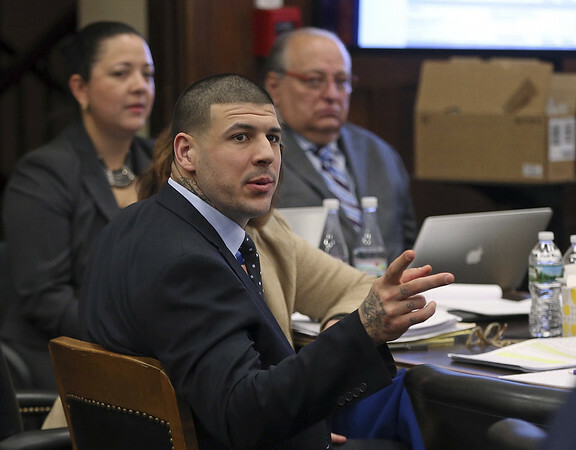 BOSTON - A legal principle that erased former New England Patriot's player Aaron Hernandez's murder conviction after he killed himself in prison is outdated, unfair and should not stand, a Massachusetts prosecutor told the state's highest court Thursday. “He goes through a full trial, a jury who speaks for the public convicts him and because he dies, in this case commits suicide, the whole thing is wiped out like it never happened? It's not fair or just and should be changed,” Quinn told reporters after the hearing. “I'm struggling with this because we don't have any good options,” said Ralph Gants, chief justice of the Massachusetts Supreme Judicial Court. Posted in New Britain Herald, General News on Thursday, 8 November 2018 10:26. Updated: Thursday, 8 November 2018 15:35.